We know you'll love this	18cm copper saucepan	as much as we do. 1177 customers found this review helpful. Did you? Yes, I did! Lovely saucepan Excellent pan, would definitely recommend to a friend. The heat distribution is even and responsive and the handle stays nice a cool. The pan also looks fantastic and is easy to clean. 1095 customers found this review helpful. Did you? Yes, I did! Nice Saucepan I bought this as its a useful size for making sauces that dont need reduction for larger numbers. Its also one of those first go to sizes for lots of cooking needs although for boiling the humble spud/veg i still reach for a SS triply. Like the other products in the range ive found this item high quality. 1042 customers found this review helpful. Did you? Yes, I did! Solid Saucepan Does what it says on the tin, cooks beautifully! Its a lovely heavy weight that is very responsive to the heat that you apply to it. 1014 customers found this review helpful. Did you? Yes, I did! Brilliant results & fabulous looks! The 18cm copper saucepan is just fantastic - such a perfect size! I use it all the time & get great results with everything I cook in it. Water boils fast, heat is evenly distributed - these are the subtleties which make Falk worth every penny. I love my copper pans so much - they are brilliant to use & beautiful to look at. I clean mine obsessively after every use! I wouldn't hesitate to recommend them to anyone who appreciates the joy of cooking great food with fabulous equipment. 1009 customers found this review helpful. Did you? Yes, I did! Handy Size Ergonomically sound, very handy size and extremely well engineered. What more can be said? 981 customers found this review helpful. Did you? Yes, I did! Good size Good pan of useful size but find I use the saucier more often. 978 customers found this review helpful. Did you? Yes, I did! A good sturdy product I have cooked nearly everything in this pan, it makes the most amazing mashed potatoes out of boiling the potatoes followed by draining and putting the potatoes back in the pan to let it steam for five minutes. This is to show that this pan has a good heat conductor and keep things warm. I would love to complete the saucepans set, a very good investment to have but for now this will have to do. Great sized pan This is my second saucepan from Falk and I'm certain it wont be my last. The pan is a handy size for most tasks and is a pleasure to use. 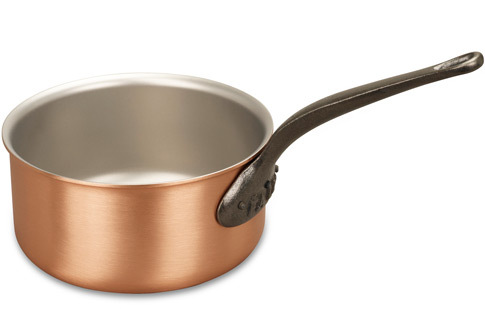 A great starter pan for anyone looking to delve into copper cookware. Also, as per usual, the service offered by Carol and Neil is second to none with great customer support and speedy delivery. 967 customers found this review helpful. Did you? Yes, I did! 964 customers found this review helpful. Did you? Yes, I did! 18cm Saucepan Thank you so much for your excellent service. I don’t usually feel moved to comment but I have been impressed! My daughter received her delivery yesterday and is delighted with her gift. The delivery was quick and efficient, given it was to an international address (4 days from my internet order on a bank holiday!) and I was well informed throughout the process. 926 customers found this review helpful. Did you? Yes, I did! Great workhorse A good all-rounder. Copes with whatever you need it to. Sturdy - but not too heavy - and looks great. Perfect for everything from thin sauces to stews. 887 customers found this review helpful. Did you? Yes, I did! 849 customers found this review helpful. Did you? Yes, I did! 847 customers found this review helpful. Did you? Yes, I did! Handy saucepan We have a whole set of Falk pots and use them for all the cooking we do. They are a joy to handle and this 18cm saucepan is no exception - equally good for making curry sauces and for boiling potatoes. 832 customers found this review helpful. Did you? Yes, I did!